Microsoft’s Windows Phone 7 smartphones have suffered a rather muted launch across the globe, with a raft of uninspiring handsets and missing core features causing many to skip the new mobile OS on the block, despite all this, the turnout is a tad bit interesting when compared to its competition. According to a new study though, it appears those who do actually stump up the cash for Windows Phone 7, tend to be rather taken with their purchase – even more so than owners of Google Android-powered phones. The report by Changewave Research, points to one intriguing result – more Windows Phone 7 owners would call themselves ‘very satisfied’ than Android owners. Of course, both groups of users are in the minority when compared with Apple’s iPhone buyers. Interestingly when it comes to WP7 vs. Android, while the former does sport higher satisfaction numbers, the latter is streets ahead in terms of market share and the number of apps it carries in its Market. Is Microsoft’s operating system simply misunderstood by the masses? One possibility for Windows Phone 7’s poor showing in the sales charts is its predecessor, Windows Mobile 6.5. Many saw Microsoft’s older operating system as a business tool that just didn’t have enough legs to compete with the likes of Blackberry, and users outside the enterprise didn’t like the user interface. And interestingly, Windows Mobile 6.5 has died out courtesy Microsoft’s Windows Phone 7 itself. A lack of top-notch apps also helped to kill Windows Mobile 6.5, despite being in the market for a considerable amount of time. 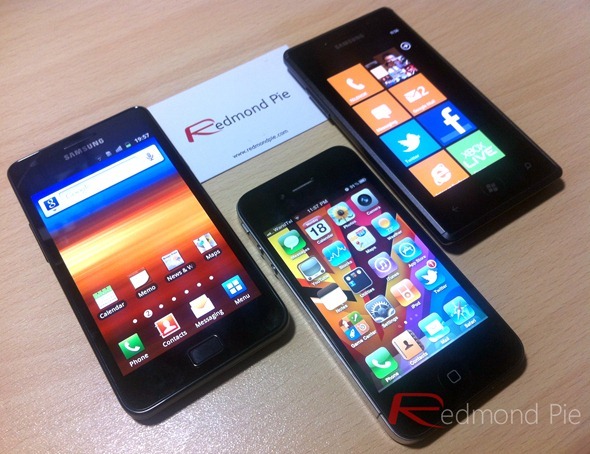 Apple’s iOS and Microsoft’s WP7 will both receive large updates to their core functionality in the coming months. With iOS 5, Apple has completely rewritten the way it’s iPhone, iPad and iPod touch handle notifications – a long standing gripe for many users. Other, less prominent improvements are expected, along with hooks for Apple’s new iCloud service, and tons of other mouth watering improvements such as Twitter integration etc. Microsoft will finally bring multitasking to its Windows Phone 7 system with the upcoming ‘Mango’ update, something which we wished for here at Redmond Pie for a long stretch of time. Google too, for its part, is continuing to iterate on its already successful Android platform, too. Will the changes to all three players in the mobile operating system game see the above graph change next time around? Maybe.